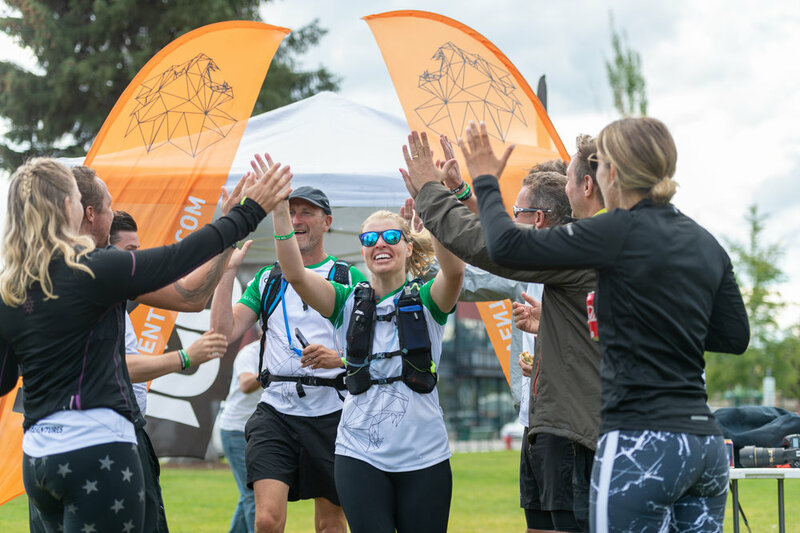 Gemma Sisson, 28, took part in IGO W114 in September 2018, a four-day staged multisport adventure held in Montana. She runs her own cake-making business, the Kitchen Mixer, based in Buckinghamshire and wasn’t much accustomed to the outdoors, nor had she taken much exercise in the years before entering, but she wanted an adventure, so she entered the race and organised a programme of fitness to get ready for it. IGO W114 is held each year around Whitehorse in Montana, on the edges of Glacier National Park. It is a staged race of four to eight hours of activity each day: Day 1 is a run-swim-run, Day 2 a 63km mountain bike ride with 3000 feet of ascent, Day 3 a paddle on the Flathead River and Day 4 a 40 km run into Whitehorse. All photos courtesy IGO Adventures. See more about IGO Adventures. Why IGO W114? Why now? Gemma Sisson: Having invested a lot of time over the last five years into growing my company, I wanted 2018 to be more about personal satisfaction and finding that seemingly elusive work/life balance. I had been very non-committal when it came to exercise before signing up, and so IGO Montana offered a perfect challenge; the opportunity to take part in something out in the wild and an excellent focus outside work. I wasn't looking for a competitive race so IGO's ethos of "compete or complete" really captured me. What makes IGO Montana special? If I had to use one word to describe Montana it would be Majestic! Second to that, Vast. Being surrounded by the mountains and Glacier National Park is really special and camping in the wilderness whilst being off-grid really is something to relish too. It certainly makes you appreciate the natural beauty around you. There was a calmness in camp and in a way the chilly evenings added to the atmosphere. We sat around the camp fire with fellow camp mates (and crew), who we had only met a few days before, but already we felt like we knew each other from previous adventures. A shared experience creates a common bond. The camaraderie of cheering everyone into camp each day is a testament to what a great team we became. It still brings a smile to my face. I won't forget fellow participant Tim, perched on a log down the hill from the finish line, shouting words of encouragement to keep us going for the final few metres of the first day. For me, that really captures the essence of IGO. All in it together. The temperature took us slightly by surprise. The week before our arrival, Whitehorse had sunny skies and warm temperatures. Roll forward to the 'Brits' arrival and the temperature plummeted - maybe to make us feel more at home?! Rob, a local guy in charge of all camp logistics confirmed it was unseasonably cold. IGO W114 is a perfect mix of disciplines and the order of the days worked well. The kayaking came in between two days of endurance running and cycling, so it was ideal for resting the legs. The route was laid by expedition leader Bobby and when I found myself alone on the course, it gave a great sense of comfort to see his signs or markers on the ground. Having never undertaken such a challenge or adventure like this before, I wasn't sure of what to expect, but the whole process ran seamlessly - a testament to the crew and all that went on behind the scenes. They became just as much part of the team, especially in the evenings when we sat and shared our stories from the day. Did you get your training and preparation right? I trained for 6 months prior to the trip. My main focus was to complete the course and to enjoy it as I went, rather than to worry about how fast I got round. I really was starting from scratch so I enlisted the help of a triathlete coach who guided me through swimming, cycling and running and showed me how to train for endurance. I had never been opening water swimming, let alone owned a wetsuit, yet I found myself thriving in the new experiences of training and getting fitter. Open water swimming has been a revelation and I love the sense of freedom it gives you. Preparing for the event also involved getting a kit list together. Although this can seem like a never ending collection, I broke the list down into what I would need for each day and made sure I was covered for all weathers. It is not essential to have your own wetsuit but I am glad I did as it was great for practice. Bikes and kayaks are provided out there. What was the most challenging moment on the course? Was there a particularly special moment? …where we realised just how far we had come - over 3000ft. In that moment we were surrounded by a herd of deer. Just us, two bikes and the wildlife atop the mountain peak, with trees and mountains as far as the eye could see. Of-course we still had to get all the way back down. And it was fair to say after six gruelling hours in the saddle, cycling through what felt like three different seasons in a day and a torrential rain storm for the last 15km, I was quite emotional when I crossed the finish line. This amateur cyclist had done it (in her own time)! And crossing the finish line at the finish of the event too I really was overcome - after six months spent preparing mentally and physically, this was the reality of completing the race and overcoming the challenge. My teammates welcomed me over the line with open arms and huge grins on their faces. For a moment in time we had all removed ourselves from our usual lives and embraced a transformative wilderness experience. A collective group of strangers at the start of the week, we were now friends and teammates who had made it through together. Finally, swimming across Whitefish Lake, I found myself physically having to stop to absorb the moment. I was in the middle of the pack and I could see orange swim hats bobbing in front of me and behind. IGO Montana was underway and it all seemed slightly surreal. IGO Adventures really did give me a good taste of the outdoors and I couldn’t have asked for a better experience... To complete the race you need to have a basic level of fitness but you don’t need to be a pro by any means. An enthusiastic attitude and a willingness to try will get you just as far! It is all about positive, mental attitude. As participants we all had different levels of fitness across a range of ages, but there we were at the finish line having all completed the four days start to finish. Cycling will always be my nemesis, there is only so much peddling my legs want to do.